--> India on 16 February 2015 inked a civil nuclear cooperation agreement with Sri Lanka, making the first breakthrough with the new government in the island nation. --> Parleys between Prime Minister Narendra Modi and Sri Lanka’s new President Maithripala Sirisena in New Delhi ended with both sides signing four agreements, including one for cooperation on peaceful uses of nuclear energy. --> They also agreed to expand defence and security cooperation. --> Yuvraj Singh was bought by Delhi Daredevils for a whopping sum of Rs 16 crores in the IPL 2015 auction held on 16 February 2015. --> While Angelo Mathews (7.5 cr to DD), Dinesh Karthik (10.5 cr to RCB) were also bought for hefty sums, the talk of the auction was unheralded spinner KC Cariappa who was bought for 2.4 crores by Kolkata Knight Riders. --> Hashim Amla, Kumar Sangakkara and Mahela Jayawardene who went unsold, despite being world class cricketers. 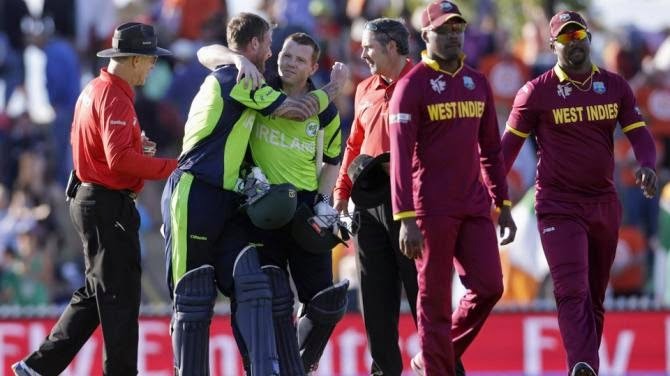 --> Ireland justified their giant-killer tag by creating the first major upset of the cricket World Cup, shocking West Indies by four wickets in their opening encounter at Saxton Oval, in Nelson, New Zealand on 16 February 2015. --> Chasing 305 for a win, Ireland rode on brilliant half-centuries from Paul Stirling (92), Ed Joyce (84) and Niall O'Brian (79 not out) to canter home in 45.5 overs. --> Former Maharashtra home minister and senior NCP leader RR Patil passed away on 16 February 2015. --> Mr Patil was among the longest serving home ministers of Maharashtra and was also one of the most powerful ministers in the Congress-led coalition that ruled the state till last year. --> Anirban Lahiri, who recently won the Malaysian Open, bagged the Best Professional golfer of the year award at the Take Solutions India Golf Awards 2015 in New Delhi on 16 February 2015. --> Delhi's Vani Kapoor was declared the Best Professional Female golfer of the year at the dazzling evening in the presence of Union Power Minister Piyush Goyal. --> The India golf awards, powered by GolfingIndian.Com, is the country's foremost awards for recognising and rewarding golf excellence. --> Infosys, on 16 February 2015, announced that it had signed a definitive agreement to fully acquire U.S.-based automation technology provider Panaya for an enterprise value of $200 million. --> This is the company’s second largest acquisition after it acquired Zurich-based consulting company in 2012 for around $350 million. --> India-born Punit Renjen was on 16 February 2015 appointed the next chief executive of US-based accounting giant Deloitte's global operations, becoming the first person of Indian-origin to head a 'Big-Four' audit firm. --> Hailing from Rohtak, Haryana, Mr Renjen will assume his new role of Deloitte Global CEO from June 1. --> India has ceremonially handed over to Bangladesh a vintage Dakota aircraft, which played a crucial role in the country's 1971 liberation war. --> The Dakota aircraft played a crucial role in the liberation of Bangladesh from Pakistan and formation of Bangladesh Air Force (BAF). --> It was used for air dropping troops in Bangladesh's Tangail during the 1971 war. --> Veteran cartoonist, columnist and political activist Rajinder Puri died on 15 February 2015 after a brief illness. --> Born in 1934 in modern-day Karachi, Puri was known for his incisive and critical political cartooning. --> YES Bank has succeeded in floating the country's maiden green infrastructure bond issue for Rs 500 crore, against which it has received commitments of over Rs 450 crore at sub-9% interest rates. --> The proceeds of the bonds, which are for a tenor of 10 years, will be invested in renewable energy projects such as solar power, wind power, biomass and small hydel projects.